CALL ME LUCKY – REVIEW – The guy from Police Academy 2 makes one of the best documentaries of the year. 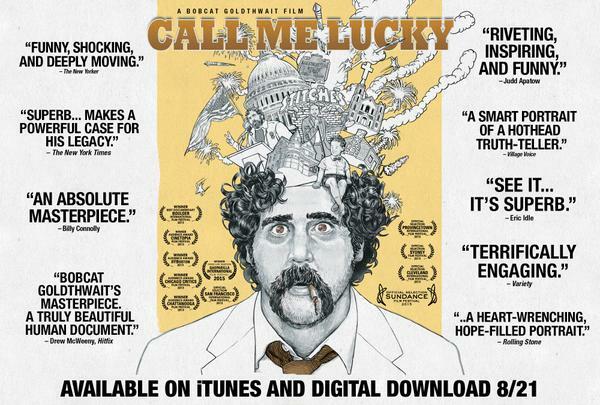 Bobcat Goldthwait’s documentary Call Me Lucky is a personal and loving tribute to acerbic political comedian and personal friend Barry Crimmins. Haling from a little known suburb of New York State, Skaneateles – “the name comes from an old Indian word meaning: Beautiful Lake Surrounded by Fascists”, Crimmins notes – Crimmins carved himself a role as stand up and comedy club manager, setting up first in his home town and then in Boston. Nurturing such talents as Goldthwaite himself, Steve Wright, Tom Kenny (who went on to Spongebob fame) and many others, Crimmins was a powerful personality, caring for the talent with great generosity but at the same time being highly critical and demanding of comedians to excel themselves. He was particularly cutting of the kind of homophobic, misogynistic schtick which passed for edgy in Reagan’s America. His own routines were couched in an angry and well informed satire that, along with his often uncompromising socialist principles, put him at odds with the audiences of the day, anticipating the cult status of the likes of Bill Hicks and Hicks-clone Denis Leary. If Crimmins’ political comedy was the only topic of the documentary, Call Me Lucky would already have earned its right to exist in uncovering an under-appreciated American artist and social activist. However, in 1992, Crimmins went on stage and delivered a monologue that recounted his own experience of being raped as a child. Many of his best friends didn’t know anything about it and the public revelation was a watershed for Crimmins, as he decided to confront his demons and specifically the abuse going on via the chat rooms of the nascent internet. His activism took him all the way to Washington where he gave testimony at a Senate hearing and was instrumental in educating the legislators about an issue that no one wished to talk about. Call Me Lucky is the tale of a survivor, an activist and a brilliant comic talent. It will turn many people on to the work of Barry Crimmins and his status as a true American hero.